10 x 8 x 4cm. In collaboration with Eden St James and Lot de Witte. 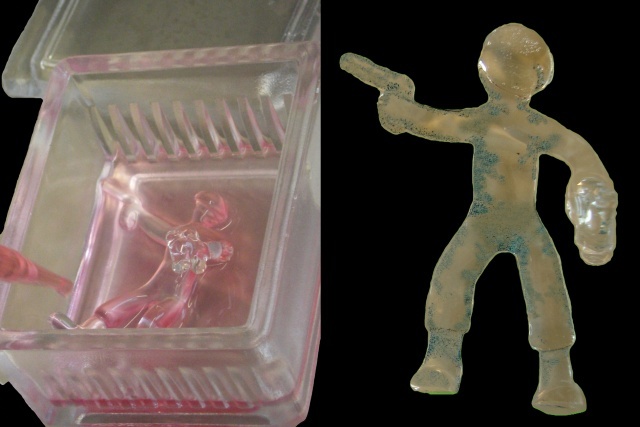 Human epithelial cells (he_la cell line) were tissue cultured over a glass soldier figurine. The tissue was then infected with HIV-1. The he_la cell line used posses a particular enzyme when infected with HIV-1. When stained with a specific substrate the infected cells express a blue colour, which can be seen with the naked eye (the blue speckles on the glass figurine). Proposed governmental stances towards HIV immigration in Australia conjure a view of the HIV positive body as a tool of biological weaponry which needs to be geographically confined. This kind of stance imparts particular prejudices in relation to the assumed behavior of HIV positive individuals. The analogy of the HIV positive person as potential biological terrorist is one of great interest and concern.